Charles Frederick Worth arrived in Paris as a sales assisant from a modest birth in Lincolnshire with not a word of French and no more than a five pound note in his pocket. Fourteen years of hard graft later he was clothing the French Empress Eugenie and rocketing to worldwide fame, setting fashion principles that last to this day. 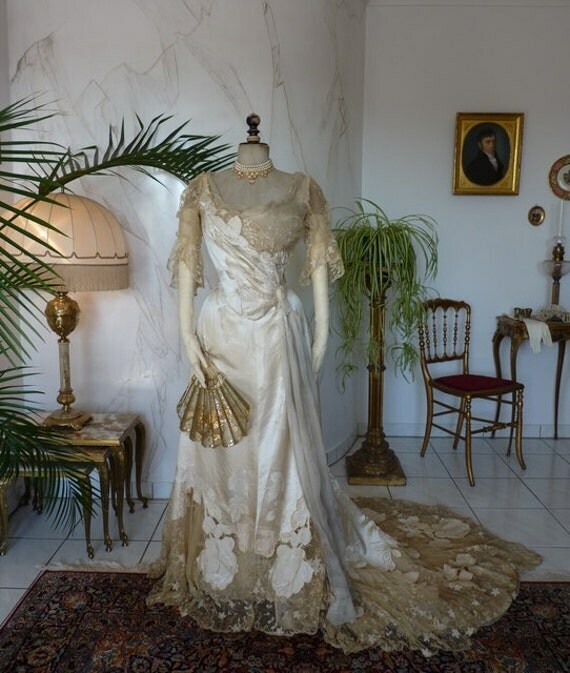 After years working in a Piccardilly department store – when he also spent a great deal of time studying historical clothing in the National Gallery – he set about making dresses alongside his sales work at Gagelin-Opigez & Cie, a high-end Parisian firm that sold silk fabrics to the court dressmakers, and his skill was quickly noticed, winning awards as the Universal Expositions in London and Paris during the 1850s. 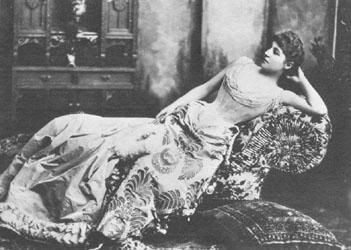 When he opened his own shop in 1858 he was introduced to the Empress Eugenie who had been a customer at Gagelin and she made him her court designer and soon he was clothing such high-society ladies as Lilly Langtry and Sarah Bernhardt (left). Known as the father of couture he came to define how we now see the fashion world with season’s styles showcased on models and then made to order and to measure. Sadly little remains of the original brand except for this great legacy. In 1952 the Charles’ great-grandson Jean-Charles retired as the last member of the family to lead the company and the house shut down the couture services in 1956. The brand was revived in 2010 with a fresh take on the original styles but was unsuccessful and did not last beyond 2013. Worth was an apprentice at the age of 12 and didn’t move to Paris for eight years. Once there it took him a further six years before he had his big break for Gagelin at the Great Exhibition at Crystal Palace in 1851 and then seven years later he opened his shop. That means even as an adult he spent 13 years developing his skills before he launched independently. Even as a teenager he was studying historical costume in paintings in his spare time, something we take for granted thanks to Pinterest. Today original House of Worth garments are rare and valuable like the example pictured. Even this piece was released by The Museum of Early Southern Decorative Arts to raise much-needed funds. The highly fashionable Empress Elisabeth of Austria wore a Worth dress in this famous portrait from 1865. Worth also designed her coronation dress worn two years later with a gown made of velvet and white silk, although black and white photography and contradictory paintings mean no one is quite sure exactly what it looked like. Her life was wrought with tragedy and she is renowned for only wearing black after her son Rudolf’s suicide in 1889, although some believe even this was more to do with a fashion trend. Her rigorous attitude to appearance reads more like a modern celebrity’s – she maintained a constant weight of 50kg throughout her life despite standing nearly six feet tall and trained her waist to 16 inches with customised leather corsets. Her beauty became her only outlet but also her downfall, suffering throughout her life from what would now be regarded as anorexia and depression. Even her death resembled an operatic tragedy when in 1898 in Switzerland an anarchist had intended to assassinate the Duke of Orleans but, on learning he had already departed, resolved to kill Elisabeth as an alternative sovereign power.